For class, students were asked to read Chapter 7.1 Woodstoves in How Things Work: the Physics of Everyday Life and watch the following videos. I started class with a lecture on woodstoves and did a few demonstrations. I had a small candle and we talked about what was required for it to burn – oxygen, fuel (wick & wax) and watched it go out when I put a glass jar over it, depriving it of oxygen. I also put some food coloring in a beaker of cold water and showed the students how the food coloring just sank to the bottom of the cold water. You can also drop some food coloring into some hot water and see that it mixes much faster, demonstrating convection. Lastly, I had some magnesium ribbon left over from chemistry last year so I burned a small piece of that by placing it over a propane burner – you can see photos of it in last year’s post. I burned the magnesium ribbon to demonstrate that burning produces light as well as heat and to show that chemical bonds require a bit of energy (activation energy) to break them. The magnesium ribbon needed to be over a hot flame for 20 seconds or so before it started to burn. I found a lab for specific heat online at physicslab. The link will take you to the lab handout and you can click on a printable version. Students measure the mass of an empty styrofoam cup and again with approximately 50ml of cold water in the cup. The difference in the masses gives them the mass of just the water. They also measure the mass of a metal cylinder and then place it in a beaker of boiling water. After a minute or two its a safe assumption that the metal cylinder is now at the same temperature as the boiling water, roughly 100 Celsius (ours was measured to be 99.9 Celsius). Students then put the Vernier Go Direct Temperature Probe in the cold water and set up an iPad with the Graphical Analysis app to collect temperature data for 2 minutes. When they were ready they lifted the hot metal cylinder out of the boiling water, letting excess water drip off, or touching it lightly to a paper towel before putting it in the cold water. Students stirred the water gently with the temperature sensor making an effort to keep it from touching the metal cylinder. The temperature of the water rose approximately 6 degrees Celsius in just a minute or so while the temperature of the metal cylinder dropped over 70 degrees Celsius. Students were given the specific heat of water of 4.184 J/gC and were able to calculate the heat gained by the water, Qwater = mwatercwaterΔTwater. We assume that the heat energy gained by the water is equal to the heat energy lost by the metal cylinder (Qwater = Qmetal) so we can use the same equation but solve for the specific heat of the metal, cmetal = Q/(mmetalΔTmetal). All the groups got specific heats very close to the expected values for the metals we were using (copper, brass and aluminum). Temperature of water as hot metal cylinder is placed in the cup. Graph from Graphical Analysis App using Go Direct Temperature Probe by Vernier. I’ve done labs like this before using regular thermometers and it works just fine, but using a temperature probe just makes it a little bit easier and produces a beautiful graph of temperature as a function of time. The only new physics ‘toys’ I bought for teaching this year were some Go Direct sensors by Vernier. They work directly with an iPad via bluetooth and their cost was fairly reasonable ($59 & $79 for the ones used in this lab) for a small class. For today’s lab the students needed to measure the pressure of a gas as they changed its volume (at constant temperature) and as the temperature changed (with constant volume). syringe and then attached it to the sensor. One student in each group connected their iPad to the sensor via bluetooth and the Graphical Analysis app. They then changed the volume of the gas sample by pushing the plunger in on the syringe and recording the pressure and volume. They also took data at lower pressures by increasing the volume, pulling the syringe out. The volume is easily read off the syringe. The data came out great. Some students graphed the results by hand, some used the Data Analysis app or the Graphical Analysis app, did a fit to the data and found that pressure did indeed depend on 1/Volume. Solving the ideal gas law for P (pressure), you get P = nRT/V and in this experiment nRT are all constant (n = number of moles, R = ideal gas constant, T = temperature). Since I only had one pressure sensor the students had to wait and take turns doing the experiment, but it only took about 10 minutes to take the data you see in the graph on the right. I put the next homework assignment on the board and had students work on that until it was their turn to take data. This worked sooooo much better then when we did this lab in the past using a syringe and balancing books on it, calculating the pressure on the syringe from the weight of the books and then measuring the volume. It just never came out very well so I’m very glad I bought this sensor, it made this lab a lot easier and it actually worked! This is one of the few labs you end up doing in both chemistry and physics class so I should get plenty of use out the pressure sensor. time so we had one student measuring the pressure and another student measuring the temperature. The pressure sensor came with the stopper and tubing seen in the photo to the left. It fit a flask I had and that became our gas sample for the second experiment. We did this experiment as one big group. The first data point was at room temperature, then we placed the flask in an ice water bath to get a lower temperature data point. Then we put the flask in a warm water bath and a hot water bath for a total of 4 data points. You can see the results in the graph below, pressure depends linearly on the temperature of the gas when the volume is held constant. From the fit you can also see that the y-intercept, b, is pretty much zero, which is what you would expect. Pressure should be zero at T= 0 K, absolute zero. From the ideal gas law, P = nRT/V, in this experiment n (number of moles) and V, the volume were held constant and we see pressure equals a constant times temperature. I’m very happy with these sensors, this lab was always a chore and now its so easy. I’m going to have the students write up the results of this lab in a formal lab report. 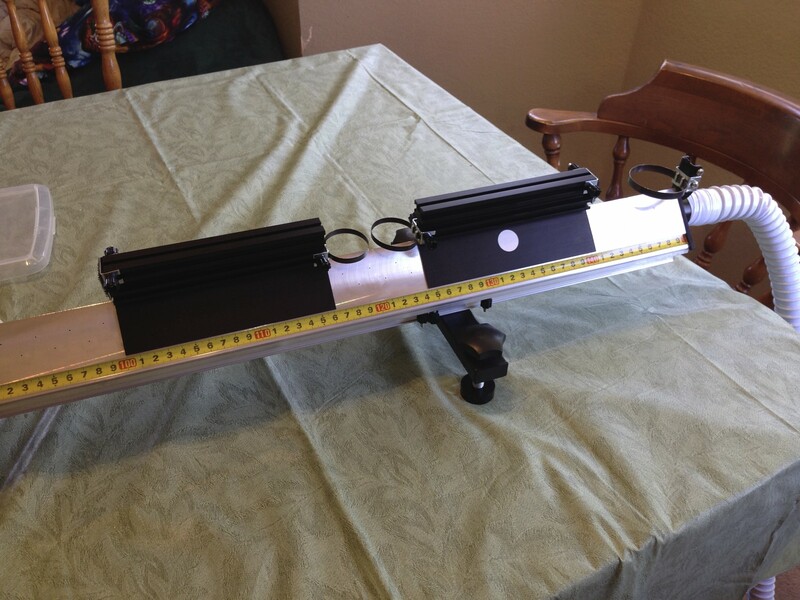 At the end of class I brought out a windbag – basically a 2 meter long thin bag, roughly 6 inches in diameter. I laid it out on the table and asked my students how many breaths they thought it would take for me to blow it up. Most immediately said a LOT of breaths, but one already knew the trick and said I could fill it with one breath – which is the right answer! By holding the end of the bag wide open and having the bag laid out on the table, I had my mouth about a foot from the opening of the bag and blew into it. Blowing into the bag at a distance lowered the pressure around the mouth of the bag causing the air around it to rush into the bag – hence filling it with one breath. I had a box of these bags and each student got to take one home. These were more fun than I expected and a nice demonstration of Bernouilli’s principle. I follow a lot of science related organizations on facebook and this game called Quantum Moves by Aarhus University popped up on my feed this weekend. Its part of Scienceathome.org where apparently they are designing games/apps for the public to play and then using the results of the game play to design better experiments in the lab. The Quantum Moves games displays an atom as its wavefunction stuck in a potential well, and you have to move the potential well around to move the atom to a desired location. It starts off easy enough but the problems get harder and harder as you go. I think this is a great game for physics students since its kind of hard to play with wavefunctions in a highschool lab. Today was very similar to last weeks class but instead of having the cart move at constant velocity, we wanted constant acceleration. Following in the steps of Galileo we inclined the track by placing a few blocks under one end, giving an angle of only a few degrees. 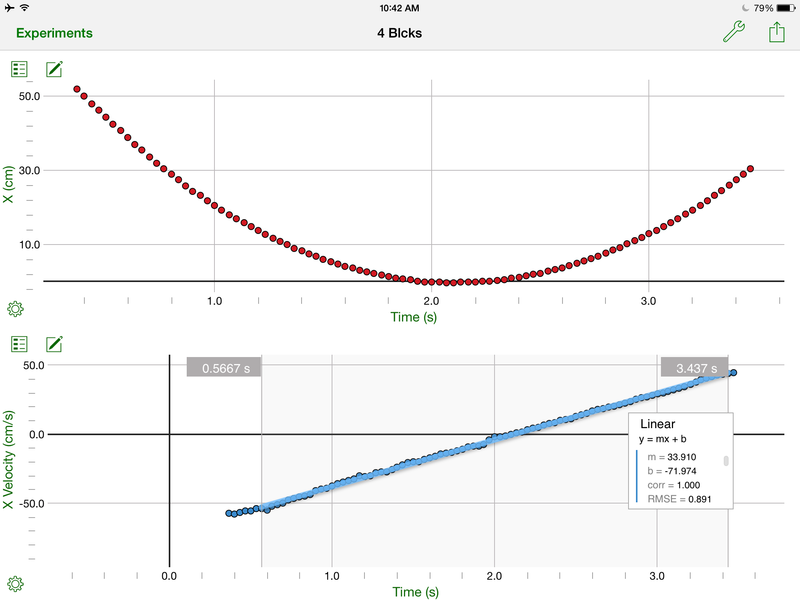 Data was taken with the Video Physics app and then moved to the Graphical Analysis app by Vernier. The Graphical Analysis app gives you more control on how your graph looks, and it can perform a best fit of your data (find the slope of the best line that describes your data). We calculated slopes by hand last week but this time I let them use the app. Everyone had very nice linear graphs of velocity as a function of time (blue line below). We took data as the cart traveled up the track, slowing down, until it stops and then accelerates down the track. You can see on the photo above the red data points marking the position of the cart for each time step. Just by looking at the smaller distances between the dots at the high end of the track you know the cart was moving slower. Before the kids took data they made predictions of what they thought the position vs time, velocity vs time and acceleration vs time graphs would look like. Most of them knew the velocity vs time graph would be linear and the acceleration vs time graph would be a horizontal line (constant!) but it can be hard to visual what that means for the position vs time graph. By taking data with the cart going in two directions, I’m hoping their data helped get it across that the acceleration was the same the entire time even though the velocity changed direction (went from negative velocity to positive velocity – increasing at a constant rate). When they had their graphs printed out and their acceleration reported with correct units and uncertainty, I had them look back at their graph predictions and see how they did. When we were done with the lab, I introduced a bit of a calculus, explaining how finding the slope of a line is the same as taking a derivative in calculus. None of these students are in calculus though a few are starting pre-cal, so we won’t be using calculus in this class, but I want them to see how its used so when they do start seeing it in math, they’ll understand why its useful. I also worked some problems in class and tried to demonstrate that when working on physics problems, you start by sketching the problem… stick figures come in to play a lot, and by writing down all the things you do know and what you are looking for. For example, if the problem says you drop a pebble, then you know the initial velocity is zero and its going to be accelerating downward. If the problem says the pebble is thrown, then you know the initial velocity is nonzero. Next week we cover Chapter 4 – forces. The experiment we did today could also be done with a marble on a track, you don’t need the air track to do this. New Physics Toys… I mean lab equipment. I wouldn’t have bought this air track for just my kids, its too expensive. But one of the advantages of doing science with a group is splitting the cost of equipment. Since we’l be doing honors (AP) level physics this year I thought this was a worthy investment. We’l probably use it for 6 or 7 weeks of mechanics labs – motion at constant velocity, constant acceleration, elastic and inelastic collisions, conservation of momentum and simple harmonic motion (you can hook up two spring to a cart and watch it oscillate back and forth on the track). We’l use the Video Physics iPad app to record and analyze the motion. My younger son wanted to bring it out to show his older brother how it worked since he’d been at camp when it arrived. I think he’s a bit disappointed we’re not using it in his science class this year, but he can be my tester and test out the labs before the physics class or even participate in the class if he wants. But as we were setting it up he asked what would happen if we turned on the air source when it wasn’t attached and we both got the same idea at the same time….let’s levitate a ball! He tried a ping pong ball first and it went flying across the house! Thinking about the exhibit at the Exploratorium with the beach ball balancing in the jet of air, I figured we needed a ball a bit bigger than our hose so the air would curve around the ball and keep it in place. 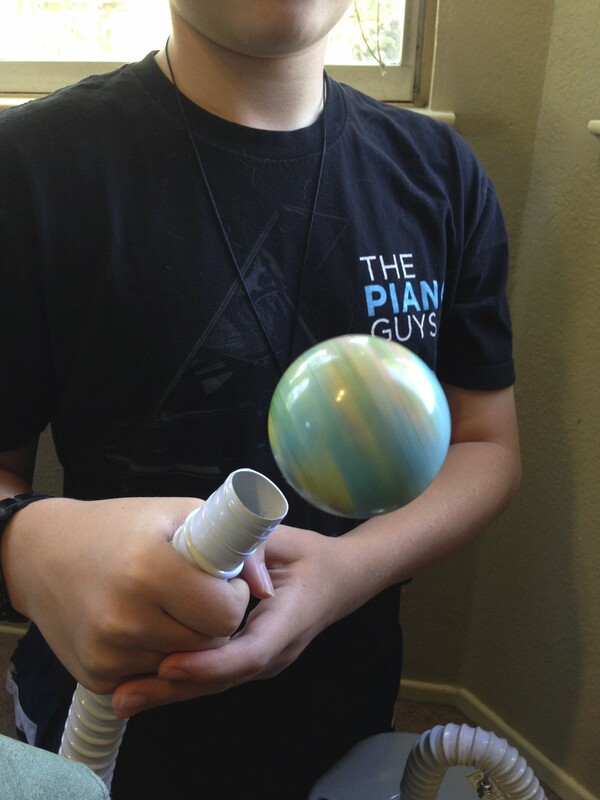 The small earth ball worked perfectly and if you give it a spin it is quite stable! I hadn’t even thought about what I could do with the air source by itself so now I can add a few labs to our schedule for fluid dynamics and air pressure.